Have your students practice math while using up to date technology! Students will improve math and computer skills at the same time! 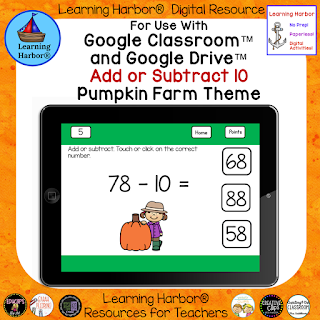 Students will click on a symbol on the home page and be taken to a random slide with an equation in which 10 must be added to or subtracted from a two-digit number. Students will solve the equation, record their answer if desired, and check their work by touching or clicking on their answer. If the student clicks on a correct answer, a slide with “Way to Go!” will pop up. If the student clicks on an incorrect answer a slide with “Try Again, You’ll Get It Next Time” will pop up. Students will love this game! Visit Learning Harbor Resources for Teachers to check out more great digital and hands on resources.